Apprise is an enterprise resource planning (ERP) software that helps consumer goods companies manage the transfer of their goods and products from one place to another. The software manages entire supply chain operations including warehousing, retailer compliance, profitability calculations, and forecasting. The software can be deployed on the cloud (public or private) or on-premises. Apprise's warehouse management module helps supply chain managers receive goods from different vendors and transfer them to their respective destinations using the tool’s ‘directed putaway’ capabilities. The software picks up products based on product name, fleet route, shipper, order number, and customer. Apprise also helps to maximize the picking efficiency with pre-pack and cartonization rules. Apprise’s wireless warehouse module helps users automate data collection, reduce warehouse errors, and improve labor efficiencies. The wireless warehouse management feature also counts the products during the unloading process at the receiving station. Apprise ERP solutions use physical inventory tools and cycle counting to gain insights into inventory costs. The inventory tool enables users to display, compare, and update their inventory on a real-time basis to ensure maximum control on supply chain processes. The application has a decision resource-planning tool that integrates with point-of-sale (POS) data, historical data, and seasonal sales to predict optimum requirement of raw materials. Apprise product lifecycle management helps product manufacturers, inventory managers, and supply chain professionals have complete control over product lifecycle, from prototyping to actual sales. The software also provides add-on systems like import tools, EDI, retail labeling, and RFID. Apprise is a great ERP system with a very wide footprint tailored for companies that sell into "big box" retailers. For the right company, you can use Apprise to manage: product development, forecasting, sourcing, EDI, sales orders, warehouse management, retailer chargebacks, customer allowances, financials, business intelligence, etc. While there may be other single-business-process systems that can do some of these better, you will be hard-pressed to find a packaged ERP system, for this price, that does all of these as well across the board.If you sell into Walmart or any other EDI-heavy retailers, the EDI Transaction Manager will be of great benefit to your organization. Apprise offers a completely hands-off approach to EDI that allows your business to focus on managing the orders, not the vast amount of technical requirements to get that order from your retailer's system. Chargeback and allowance management features make for easy management of post-sales deductions. Supplier Production Monitoring provides visibility into constantly changing production and delivery dates so that you know when the product will arrive at your distribution center. If you sell into Walmart or any other EDI-heavy retailers, the EDI Transaction Manager will be of great benefit to your organization. Apprise offers a completely hands-off approach to EDI that allows your business to focus on managing the orders, not the vast amount of technical requirements to get that order from your retailer's system. Chargeback and allowance management features make for easy management of post-sales deductions. Supplier Production Monitoring provides visibility into constantly changing production and delivery dates so that you know when the product will arrive at your distribution center. As with any ERP system with this wide of a footprint, implementation will depend heavily on having the right people in your organization participate in the implementation process. Your technical and business-user staff will play a big part in a successful go live. If you try to implement Apprise without the right expertise, you are setting your organization up for failure. Apprise has modeled everything from purchasing, logistics, manufacturing, warehouse management, and accounting and packaged it all in an easy-to-use interface. As our company has grown, we've found that the capabilities of Apprise have been able to keep up and we're using features now that we never planned on using when we first went live. Apprise has a process for just about everything and if you follow the steps, you reap the rewards in terms of efficiency and visibility. If your business is primarily B2C with a large customer list and very little operational complexity, this product may not be for you. Apprise's strengths lie in its flexibility in managing the areas of operations where things typically get murky. Think manufacturing or importing from foreign suppliers. For our business model, DTC, with a high number of products offered and a huge list of customers, we needed a system that would connect all of our company together. The accounting, purchasing and warehouse modules sync perfectly allowing us to manage our efficiencies and focus on the bottom line. Overall our company has greatly advanced in terms of profitability through our partnership with Apprise. The merchandising, product management and manufacturing processes are a bit more cumbersome than we would have expected. This is probably due to the changing focus of Apprise as they transition to a more DTC friendly system. Our hope is that the implementation of 8.0 will correct this and resolve this minor criticism of a great system. Because of the more modern interface we are able to push more data to the users who need to make business decisions based on information in the ERP. In the past this was something IT had to be pulled into, now we can just point the users to the information and they can do it themselves.WE liked the more modern interface compared to our old ERP of 15 years. The ability for users to pull data on their own and the number of functions is great. It can run across a WAN with very little latency. WE liked the more modern interface compared to our old ERP of 15 years. The ability for users to pull data on their own and the number of functions is great. It can run across a WAN with very little latency. The layout and function of the software is weak. The ability to see relevant help text and lead by example is non existent. TO much is still a manual process, they should have the ability to turn a switch for many processes that should be scheduled or just plain automatic. Easy to use and train people. Strong customer support. Small enough, so they know their customers and specific needs. Staff is long-term and consistent. Challenge to find staff who are familiar with this specific ERP and with Progress databases. Need to schedule upgrades well in advance as the team gets busy. Contact Apprise directly for pricing details. 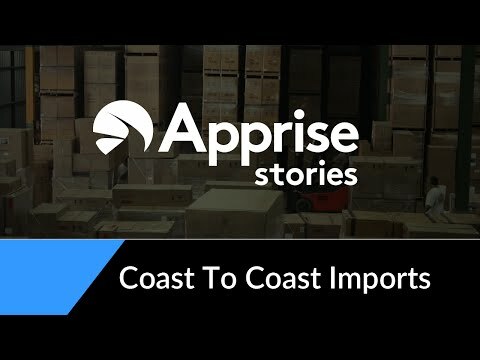 •	Apprise shipment-tracking software helps companies track products both on land and sea to ensure that they reach customers on time. •	The inventory tool helps users manage single or multiple warehouse locations while the integrated warehouse solution provides complete visibility across the supply chain. •	The software’s decision resource-planning technique helps companies eliminate stock-out situations while minimizing inventory stored in warehouses. •	Apprise’s automated physical inventory tools for warehouses remove the need for employees to fill manual entries in log registers. •	The software has a multi-currency reporting solution that helps companies manufacture products in one country and sell them in others. Below are some frequently asked questions for Apprise ERP. Q. What type of pricing plans does Apprise ERP offer? Q. Who are the typical users of Apprise ERP? Q. What languages does Apprise ERP support? Q. Does Apprise ERP support mobile devices? Q. Does Apprise ERP offer an API? Yes, Apprise ERP has an API available for use. Q. What other apps does Apprise ERP integrate with? Q. What level of support does Apprise ERP offer?